Edward Anthony started his company in 1841. The company name was changed to E. & H.T. Anthony in 1862 to reflect Edward's brother (Henry) contribution. The company was a large In 1902 E & H. T. Anthony Co. merged with Scovill & Adams to form Anthony & Scovill company. Items in this series are photographic devices designed to be inconspicuous, intended for photographers to make candid exposures without the subject being aware. The first detective cameras appeared with the production of commercially available dry plates and designs were simple box camera style constructions. These were, in fact, very similar to standard cameras of the time, but were smaller, handheld and able to make exposures relatively quickly. 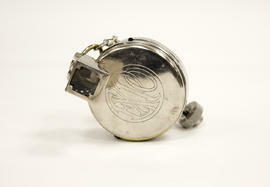 As smaller, flexible film materials became available, these cameras began to be produced disguised as objects such as pocket watches, ties, books, hats, pens and walking sticks.